The MENESR survey on students with disabilities collects data on students in each higher education institution under its responsibility who are declared disabled pursuant to the Law of 11 February 2005 on equality of rights and opportunities, participation and citizenship of people with a disability,, and who make themselves known to the disability services. For each student, the survey collects data anonymously on the nature of the disability or impairment, the adjustment measures put in place to provide support with their studies along with age, gender, subject area and study programme. The survey of PhD students takes into account students who are monitored by the student disability services, but is not able to obtain data on those who are monitored by the department responsible for staff. The survey of the schooling of students with disabilities in secondary education, carried out by the Directorate for Evaluation, Forward Studies and Performance (DEPP) and the Directorate-General for School Education (DGESCO) is able to monitor the population of students with disabilities in classes preparing for admission to Grandes Ecoles (CPGE) and the Advanced technician's sections (STS) in public and private high schools. This annual survey provides the numbers of pupils who are enrolled in school with their own tailor-made schooling programme (PPS), and their disability is assessed by the Departmental centre for the disabled (MDPH). At the start of the 2015-16 academic year, there were 23,257 students in public higher education institutions, i.e. 1.22% of the student population, who declared a disability. These numbers have tripled since 2005. 91% of these students with disabilities were enrolled at university and 71% of them were provided with some kind of support. There is more extensive, varied and better-known support than in the past, which means that these students are not excluded from the general trend of longer studies. Although their progress in their chosen paths differs from that of the population, it has been improving very significantly for several years. 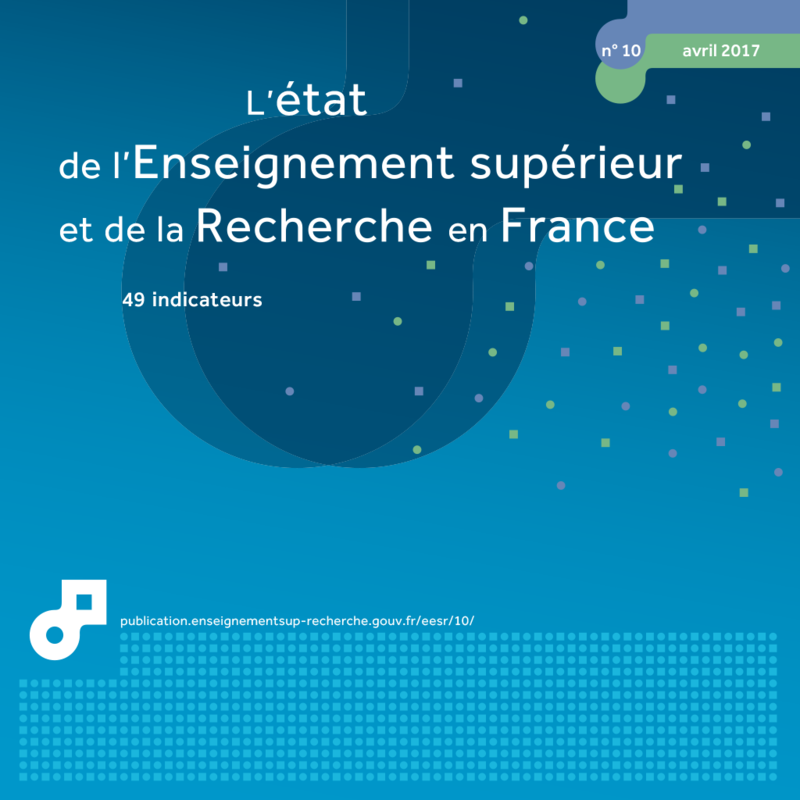 At the start of the 2015-16 academic year, there were 23,257 students who declared a disability in higher education courses in public and private upper secondary schools under contract and in public higher education institutions under the responsibility of the French Ministry of Education, Higher Education and Research. Of these, 91.4% were enrolled in universities (table 14.01) and received disability support or care. Their numbers have increased by 13.5% per year, on average, since 2005 and 15% over the past five years (chart 14.02). The main reasons for this increase were the general trend towards longer studies, more customised care, diversification and a better awareness of the support systems available. Since the start of the 2006-07 academic year, in accordance with the provisions of Article L. 123-4-1 of the Education Code, higher education institutions were made responsible for putting in place all the necessary support for students with disabilities to ensure that they can succeed in their studies and their professional integration: human and technical aids to help with learning, adjustments to courses and conditions for sitting exams. Better access to higher education, more types of support and better awareness explain the increase in the number of students with disabilities taking a Bachelor's degree (chart 14.03). Any obstacles to entering higher education have therefore been considerably reduced since the Law of 11 February 2005 came into force. However, in universities, the distribution of students with disabilities is not the same as for students as a whole. They concentrate on Bachelor degree programmes and become fewer in number as the university course progresses. Nevertheless, and throughout the training period, a reduction in the difference in the breakdown between students with disabilities and the total population has been noted for several years. In four years, these differences have been reduced especially in the first and third years of Bachelor degree programmes, where they were previously the most significant. In these institutions, students with disabilities are more likely to enrol in IUT, in Arts, Languages and Humanities and in paramedical courses. They are less likely to enrol in the Law, Economics, Management and Healthcare programmes (chart 14.04). These gaps have tended to close over the years, but nevertheless there is a link between the nature of the disability and the choice of discipline. Thus in Arts, Languages and Humanities, students with language impairments, speaking difficulties or specific autistic disorders are highly under-represented, while those with mobility or agility impairments are similar in number to that of the general population. However, the breakdown per course of students with visceral disorders is close to that of the general population. To help compensate for their disabilities, especially when taking exams, and to ensure that things run smoothly throughout their course of study, specific help is provided for these students. 71% have a support plan drawn up to monitor their studies, which can include personal assistance (note-taker, interpreter, encoder or other form of support) or technical support in having their course specially adjusted. 81% receive support during examinations (table 14.05), with at least one type of special adjustment being put in place (specifically adapted assistance, documents in Braille, French sign language interpreter, cued speech encoder, extra time). Extract from the chapter "14. students with disabilities in higher education". 2 70 responses out of 73. 3 61 responses out of 88. 4 Including Normal high schools (Écoles normales supérieures) and major institutions (excluding engineering schools). 7 out of 14. 1 70 out of 73. 70 out of 73 (excluding university of Paris Est Marne la Vallée). 1 Including vocational Bachelor's degrees, without DUT. 37,2% of students with disabilities are taking a course in Arts and Humanities compared to 28,6% of all students in 2015-16.